I will be having an exhibit at the Studio Gallery in San Francisco, in mid-April. There will be more details forthcoming. The Studio Gallery was where the Early Birds show was held last year, but they have moved to a new location, about a block away, and have a larger space. As a result, I'm spending my weekends in the studio creating more work to fill the walls. 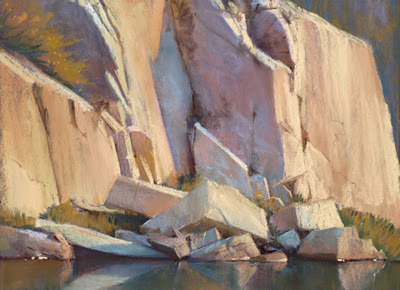 There will be about 30 pieces in the show, a selection of pastels from the Sierras, done on location over the last 4 years, as well as some recent studio pieces based on field studies. Some Grand Canyon pieces will round out the show as well, as the subject matter is pretty much the same: light, water, and rocks! on their surfaces, have fascinated me ever since my first painting trip into the Sierras in 2005. The image below is a studio version of a pastel I did in 2006 up at Garnet Lake. I recall being terribly frustrated by the piece when I was done, as the subtleties of the lit and shaded surfaces, as well as the collection of forms was a lot to get down before the shadows altogether disappeared. Sometimes the pieces that bedevil you so much in the field are worth a second look. This weekend I borrowed back the painting, found some reference images, and went at it again.